When Parliament reassembled in January 1735 the political atmosphere was decidedly more confrontational than it had been in 1728. The excise crisis had given the opposition a taste of real success. 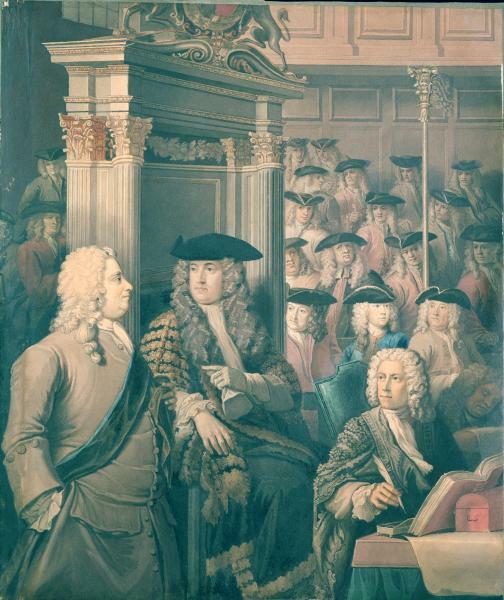 Sir Robert Walpole was no longer the invincible minister he once appeared to be, and for the future he would find himself increasingly on the defensive in the Commons. The ministry had been able to calculate an overall majority of 270 or so at the beginning of the 1728 session, but following the polls in April 1734 that figure had fallen to around 100. Although Walpole now faced a large opposition of Tories and Whigs, he would continue to benefit from its inability to unite effectively right up until the 1741 dissolution. 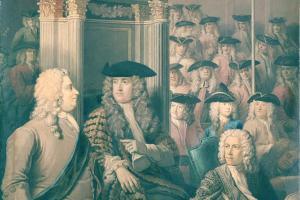 The election was held immediately after the dissolution, during April and May 1734. More than 130 contests are recorded, many of which were hard fought. The excise issue featured prominently in the more populous borough constituencies. One of the most expensive contests was fought in Walpole’s home county of Norfolk, where both Whig candidates were beaten by the Tories. A total of 409 Whigs and 149 Tories were returned to the new House of Commons. Of the Whig total, 83 were opponents of the ministry, who, with the Tories, amounted to combined opposition of 232 MPs. Disputed election hearings resulted in four Tory seats being awarded to government Whigs. A younger generation of new opposition Whig talent known as ‘Cobham’s Cubs’, after their leader Lord Cobham, quickly made an impact in debate, but created rivalries within the opposition Whig leadership. William Pulteney’s ‘patriot’ credibility wore thin as gradually he distanced himself from opposition strategy, and covertly sought ways of accommodation within a future ministry. In the Lords, the opposition had been greatly strengthened by the purging of office-holders in the midst of the excise crisis in 1733. In 1737 the prince of Wales quarrelled grievously with his father and aligned himself with the opposition. Not only did Prince Frederick bring with him some 20 of his household retainers, but he also became the pre-eminent patron of opposition, marking a revival of what historians have called the ‘reversionary interest’. The ministry also began to lose vital support elsewhere. Walpole’s quarrel with the duke of Argyll, and the duke’s dismissal from office in 1740, led to a weakening of support among the Scots MPs. In the opening session of 1735, as war raged between France and Austria over the Polish succession, Walpole famously boasted in the Commons of having kept British men and money out of it: ‘not one drop of English blood spilt, or one shilling of English money spent’. By 1738, however, relations with Spain were deteriorating once more over Spanish assaults on British shipping. The mood in the Commons was angry and uncompromising as opposition MPs took a united patriotic stand in demanding war with Spain in satisfaction of national honour. On 13 February 1741, a much-awaited ‘great thunderbolt’ against Walpole – a motion in both Houses calling for the king to dismiss his chief minister from office – badly misfired, with 290 votes against and only 106 for. At this vital moment the patriot Whig leaders had failed once more to co-ordinate with the Tories, and failed to appreciate the extent to which the motion offended traditional Tory notions concerning the sanctity of the royal prerogative. Consequently, most Tories either abstained or voted on the ministerial side. By the eve of the dissolution in April, the ministers had grounds to hope that opposition ‘dissensions’ of this kind would injure their chances at the polls.